In the summer of 2008, Gillingham Football Club took control of Gillingham Ladies FC in order to create path for player progression for their Centre of Excellence players. Martin Andrews was appointed Manager of the Club whilst GFC over saw the club’s operations. The club became independent of the club later on in its history and was led by Andrews during this spell. In order to push forwards as a professional team, Martin appointed Ian Varley as manager. Over that summer, Varley oversaw the team as it moved from a park field location to Lordswood Football Club. The club then enjoyed an immensely successful period, winning the South East Combination League by ten points and bringing home the Kent Cup for the first time in nine years. 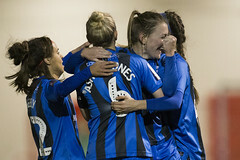 The Gills debut season in the Southern Premiership was something of a learning curve and the Ladies struggled to adapt to their new surroundings at Chatham Town FC. Gills did enjoy some outstanding victories beating Charlton and Cardiff, the two teams promoted, away from home. 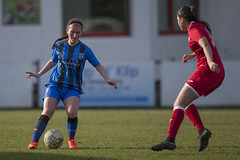 Gills Ladies finished eighth in the League after a play-off game against Havant and Waterlooville Ladies to stay in the division. As well as a successful First Team, Gills Ladies also had a successful Reserve team, who in two short years have swept all before them. They won the South East Counties Division One East title in their first season. In 2012/13 Varley left the club and was replaced by James Marrs. Although the team struggled in his first season for league wins, they excelled in cup competitions winning the Kent Cup, Ryman Women’s Cup and progressing to the fourth round of The FA Cup. Marrs introduced assistant Jack Wheeler amongst many other additions to the club staff for the 2013/14 and the club was propelled to one of its most enjoyable and successful seasons. The club retained the Kent Women’s Cup and Ryman League Cup, beat their own record in the FA Cup reaching the fifth round of the competition before being knocked out by holders and eventual winners Arsenal Ladies. Besides this, the team enjoyed their most successful season in the FA Women’s Southern Premier League, being pipped by Coventry Ladies to the title in a show stopping final match of the season. The club’s success led to Marrs winning Kent FA’S Coach of the Year 2013/14 award. 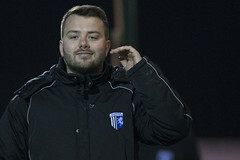 Marrs made the decision to leave Gills for FA WPL counterparts Brighton and Hove Albion. In his place, Gills recruited former club legend Simon Ratcliffe to take the reigns and lead the re-growth of the team, following several departures of first team players over the summer to Sussex. The club announced the most exciting partnership in its history back in June 2014. Officially coming under Gillingham FC, the club works with the teams to propel the women’s game in Kent even further, putting Gillingham Ladies in its strongest and most sustainable position ever. Unfortunately the team struggled following the departure of the number of first team players and was relegated to the FA Womens Premier South East Division One. There was also a managerial change in June 2015 with the club coming under the joint leadership of Darren Hare and Jack Wheeler. Part way through the 2015/16 season there was a leadership reshuffle with Jack Wheeler taking full control as Manager and Pauline Cope-Boanas (Goalkeeper coach) and Kirsty Dowle (sport psychology) joined the coaching team. Gills finished runners up and second in the league missing out on promotion but overall it was a successful season with 16 wins in the league and cup runs in the FA WPL Plate and Women’s FA Cup. 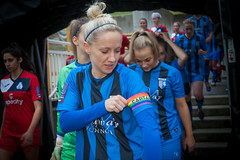 Kallie Balfour finished the league’s top goal scorer on 32 goals (39 goals in all competitions) who was fantastic all season. There were a lot of positives to take into the 2016/17 season. Gills continued their good form at the end of the 2015/16 season and during 2016/17 won 18 league games, drew 3 and lost only one game which led to a successful season by winning the league and promotion from FA Women’s Premier League South East Division One to the Southern Division. Gills also comprehensively won the Kent FA Women’s Cup against Aylesford Ladies (17-0) and had a good run in the Women’s FA Cup. 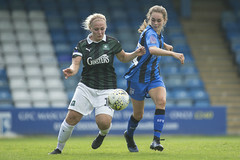 Fliss Gibbons finished as the league’s top goal scorer on 33 goals (48 in all competitions) and the team scored 175 goals in all competitions.